Grand Bahama Island (BlackNews.com) - Real Men Cook will unveil a multidimensional exhibit reflecting highlights of the 19-year-history of the Father's Day celebration in the Bahamas from October 16-20 as part of its pre-20th anniversary celebration. The Exhibit will be on display at the Grand Lucaya Westin Hotel on Grand Bahama Island as part of the kickoff in the Bahamas, which will become the first international market to host a Real Men Cook celebration. The Exhibit, which will remain in Chicago until the end of July, made its debut during the Chicago celebration on Sunday, June 15 at South Shore Cultural Center, 7059 S. Shore Drive and was a popular addition to the celebration. This one-of-a-kind exhibit features captivating historical photographs, artifacts and memorabilia. The exhibit, which will be housed in the right wing of the Center, features panels that trace the history of the event from its beginnings in 1990, to its prominence today as the premiere Father's Day celebration in America. Through dioramas and timelines, visitors to the exhibit will see past programs, recipe books, newspaper articles, and an array of images from past events. The exhibit showcases past celebrity chefs including the late Chicago Mayor Eugene Sawyer, former Cub and Major League Baseball All-Star Gary (Sarge) Matthews, Congressman Danny Davis (IL), Urban League President Marc Morial, Congressman John Lewis (GA), Tom Joyner Show Co-host J. Anthony Brown and Tavis Smiley. There's even a photo of Presidential Candidate Barack Obama in a Real Men Cook bandana, serving the masses. Also bedecking the walls are letters, legal documents, banners and billboards tracing the Father's day event. The exhibit chronicles the beginnings of the event as a brainstorm by a group of prominent Chicago women passionate about showcasing families with men working to create needed funds for nonprofits; to its growth and evolution as the premier Father's Day celebration in the nation. The diorama captures the passion of co-founders Kofi Moyo and former wife, and marketing executive Yvette Moyo, in their quest to create a celebration that has redefined Father's Day. Along the way, is a resolve to give back to worthy organizations whose mission to better families and communities mirrors that of Real Men Cook. Letters of appreciation and Proclamations from mayors and governors from all over the country dot the walls of the exhibit. Additionally, the exhibit traces the additions to the celebration including the Health & Wellness Pavilion, which includes nutritional education, healthy foods, martial arts demonstrations and screenings for prostate cancer, diabetes, high blood pressure and HIV/AIDS. The dramatic exhibit is a powerful testimony to the marketing genius of production team at Resource Associates International, Ltd. the marketing firm the Moyos founded that continues to expand the events nationwide -- and now internationally. Their passion for showcasing men in a positive light, results in a compelling exhibit. 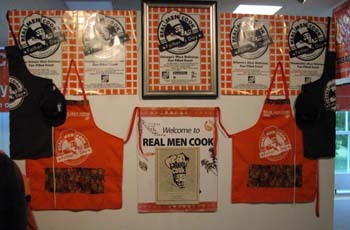 After its kickoff in the Bahamas, the exhibit will go on to tour at each market and will return to its home of Chicago in time for the Real Men Cook celebration in 2009. The team is hopeful that the exhibit's final home will be at the DuSable Museum of African American History, and planned are fundraisers to benefit the presenting nonprofit, Real Men Charities, Inc., which creates and manages health and wellness programs and others that help to build healthy families and communities. Today, Real Men Cook is in 11 cities including Atlanta, Chicago, Benton Harbor (MI), Dallas, Houston, Los Angeles, New York, Philadelphia, Phoenix, and Washington, DC. Presented by Real Men Charities, the celebrations provide a platform where "real men" from all walks of life are honored for demonstrating extraordinary commitment to their families and communities. Since its inception, the event has raised over $1 million for participating charities that partner to sell tickets, and whose missions reflect Real Men Cook's resolve to uplift family and community.